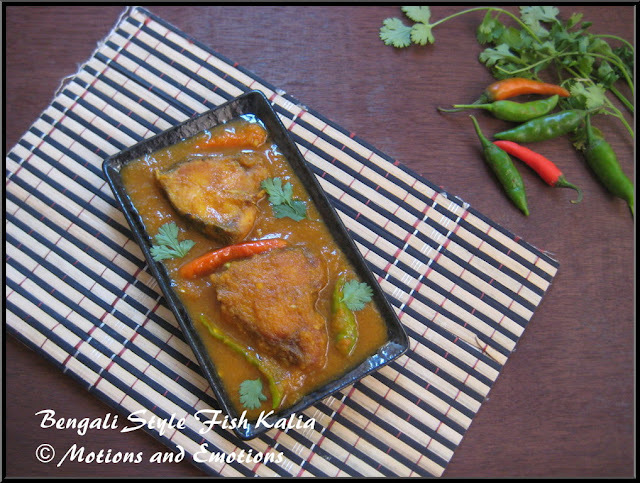 Katla Macher Kalia / Fish Kalia / Bengali Style Fish Kalia is an authentic Bengali dish. 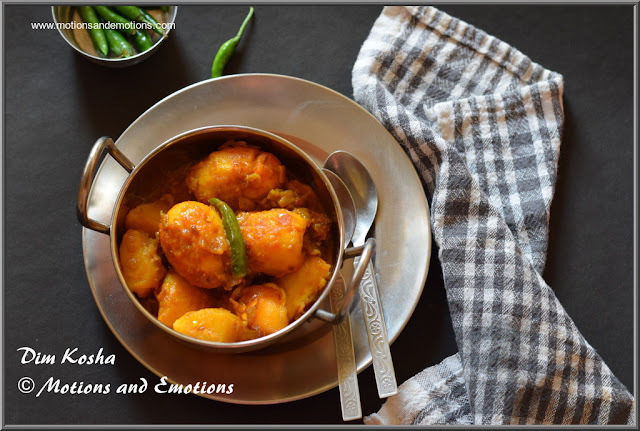 You can found this dish in Bengali Wedding Menu and many other occasions. Size of the fish is very important for the fish kalia recipe. Fish, which weighs more than 3 Kg or more, is used for fish kalia. Actually, bigger the fish size it is more tasty. Furthermore, the taste of the recipe also depends on the fish. It is not very difficult to get a big Katla (Fish) here, however it is really difficult to finish the big fish within a week in a nuclear family! While buying a big fish this time we got a partner who took half of the fish and the moment we purchased it, recipe was decided immediately:). 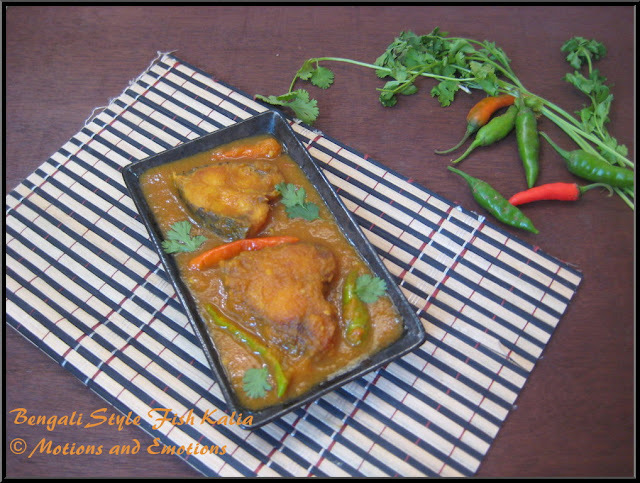 Fish lovers try this authentic Bengali dish and let me know your feedback. Clean the fish properly and marinate the pieces with salt and turmeric for half an hour. Heat oil in a wok and fry the fish pieces (both sides) till golden in colour. Keep them aside. Add cinnamon stick, clove and cardamom in the same oil (after frying the fish pieces remaining 2 tablespoon oil is enough, if more oil is there you can reduce it). Next add garlic paste and followed by onion paste and ginger paste. Cook them very well. Add sugar, salt and turmeric powder. Next goes cumin powder, coriander powder, red chilli powder and green chilli. When the mixture starts changing the colour add tomato puree and cook until the raw smell is gone. When oil starts separating add warm water 1 tablespoon and later slowly add 2 cups water. When the gravy starts boiling add the fried fish pieces and cover with a lid. After 5 minutes add fresh coriander leaves and turn off the gas when gravy is thicken. Serve with plain rice. Looks mouthwatering dear.. Need some rice to finish this..
Never made Benggali fish curry before but why not? After buying fish, I shall make for my other half. Perfect dish; love the thick gravy.